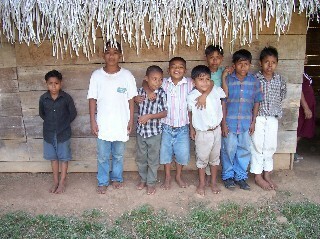 Belize became a mission for Serenity in 2000, when five members went and worked on a mission station and church. They also held a bible school in one of the villages. Visits are scheduled to assist in building churches or teaching. In June 2005, we had 12 members to go into two villages and hold bible school; and Pastors Jimmy Flowers and Richard Weeks preached. Few Facts About Belize: Government - Belize has been an independent nation since 1981, but is a member of the British Commonwealth of Nations. Parlimentary democracy with two major political parties, the United Democratic Party, and the People's United Party. Belize has a Constitution, which includes a Bill of Rights. Size: Approximately 8,866 square miles. Belize's mainland is approximately 180 miles long and 68 miles wide. Belize also consists of over 200 islands, ranging in size from a few hundred feet to 25 miles long and 4 miles wide. Population: Is about 280,000. There is a great deal of ethnic diversity, including Hispanic, Creoles, Mestizo, Mennonite, Garifuna, Mayan, Angio-European, Middle Eastern, and Asian. Climate: Belize has two seasons, rainy (June to November), and dry (December to May), with about 160 inches of rain in the rainy season. Temperatures range from 70 to 95 degrees. Language: English is the official language with Spanish, Creole, German, Mayan and Garifuna. If you want more information about Foreign Missions, please go to the Serenity Baptist Church Guestbook page and leave a message. Thank you for your interest.